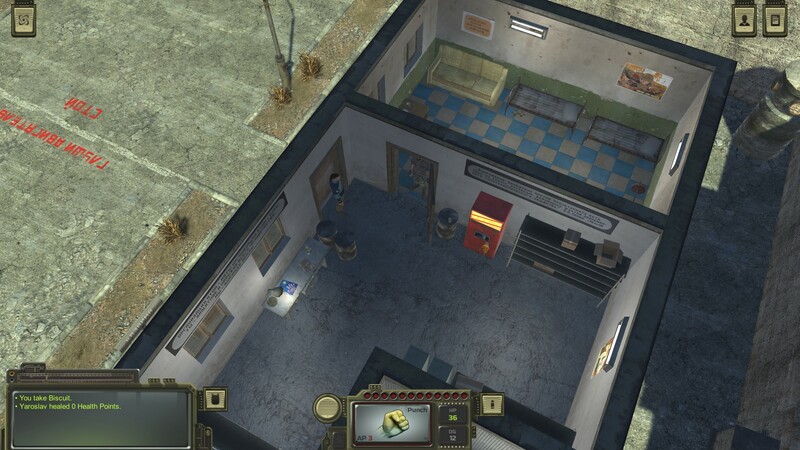 The developers behind the Fallout-inspired ATOM RPG certainly have been busy since releasing it in December. While the game is pretty damn good, I've no doubt about that, there is one part it could have done better which is the introduction. Previously, it put you into the game with a small fight scene and you were left to your own devices. That's changed, with the addition of the new ATOM base along with an actual tutorial. While a lot of it was quite obvious to me, as someone who has played tons of similar games, it does give it a more polished feeling. For those who are perhaps a little slow on the uptake, it will make the starting experience drastically better. It lets you run around and test various weapons, along with teaching your some of the UI basics. What's even better, is that you can easily skip over it by just entering the main building so they've dealt with players who don't want to do it too. Additionally they've done a balancing pass on random encounters, fixed plenty of bugs, improved companion AI and they implemented more optimisations. It really does run rather nicely now and I said in a previous article, it's practically Fallout Russia. Since release, they've managed to get a "Very Positive" user review rating on Steam so it looks like they've managed to accomplish their mission. You can find ATOM RPG on Steam. Finished my playthrough just before the patch hit. It was a really good experience then, so it getting better for a later playthrough is certainly welcome. Seems like this was made just for me! I can't remember ever playing a game like this and I barely played the game since the official release. I walked around a bit, talked to a few people but got no clue what to do or where to go. No big shiny markers pointing me where to go, which is fine, but the first combat encounter I had I died straight away vs a bear. I was weak and had no weapons. Also I was dieing of hunger and have no clue how to make/get food. So hopefully this tutorial explains all that so I can actually enjoy and play the game instead of leaving it collecting dust. The Kickstarter campaign promised DRM-Free (I didn't back it though). I'm still waiting for that before picking this up. Sojiro84 Seems like this was made just for me! I can't remember ever playing a game like this and I barely played the game since the official release. I walked around a bit, talked to a few people but got no clue what to do or where to go. Modern games really turned lots of gamers into... less self-reliant versions of themselves. A shame. Seriously, though, how was your first combat encounter a bear? They really are rather brutal early on, but the game starts with that campfire scene, which is a combat, followed by going immediately to the first town, which has a couple of rats and insects around for new players to gain XP with. Accompanied by a quest that will make you run into those. Yeah, I remember those times. I am 34 years old after all, although I barely played games like Atom back in those day's. I don't need handholding but a few suggestions would go a long way for me. Anyway, The first encounter straight at the start was just part of the 'cut-scene', so there was only 1 way that part could go. I then went to the city after talking to the guard, looked around and didn't saw anything interesting for me to do there and then went straight to the next area on the worldmap, just looking around, not much talking. I guess I just should talk to every person in every town? Sojiro84 I guess I just should talk to every person in every town? And there it is ... now on GOG!